So, it would seem that I’m not the only person who is considering the question. Only yesterday Jayne Dowle wrote the article “What it really costs to sell a property” in The Times. Jayne was kind enough to interview me earlier in the week on the subject of estate agents’ fees. We all have to acknowledge that estate agents’ fees make up a large part of moving costs, second only to stamp duty on the next purchase. Can I be honest with you? I’ve been struggling with that question ever since I started in estate agency, over 10 years ago. So, undoubtedly, the world of estate agency is changing. How much has it really changed? I find it easiest to picture it as a spectrum. At one end we have the traditional (I’m not saying old-fashioned) estate agency, with their (increasingly nicer) offices on a High Street near you. They pride themselves, rightly, on their local knowledge. It’s a no sale, no fee promise. Fees are charged as a percentage of the sale or rental price achieved. They will be there for you all the way through the transaction, from initial valuation, through sale progression, to the day you handover the keys. Wapping’s geographical area is defined by its borders with The Highway to the north, Limehouse to the east, St Katherine’s Dock to the west, and the Thames to the south. We suggest you don’t do too much experimentation with crossing the border to the south… you’ll get a bit wet! The name ‘Wapping’ was first recorded c.1220 and may have derived from words meaning ‘the settlement of Wæppa’s people’. Alternatively, it may have meant ‘marshy place’, via a connection with the Old English word wapol. New developments spring up all the time, but its not often that you witness a community being built. 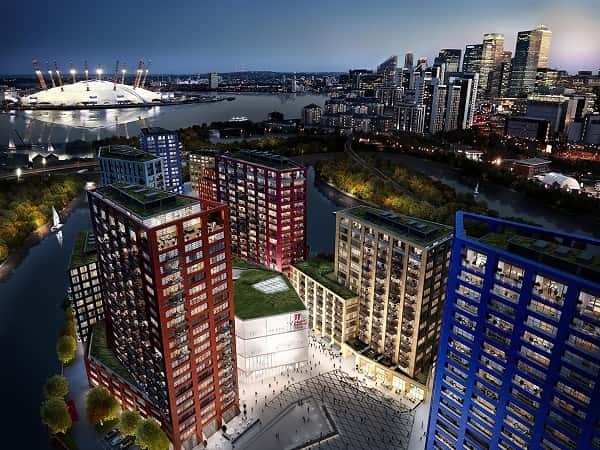 Ballymore & Ecoworld’s London City Island is just that – a new community. Comprising 1,706 apartments, completing from mid 2016 all the way through to 2019, the scheme will also result in a new home for English National Ballet, 1,801 sqm of leisure space, 4,502 sqm for offices, 1,852 sqm of retail and 2,714 for the creative industry. London City Island, or LCI for short, is designed around a mini-Manhattan concept according to the developer’s brochure, and having visited, both internally and externally, we believe that this concept has been executed. Although the buildings are undoubtedly ‘new’, there are nods to that warehouse-loft feel. Flat-fronted buildings with large windows, much higher-than-average ceiling height, strip wood flooring, Victorian-style radiators and butler sinks all combine to give a rather rustic impression.